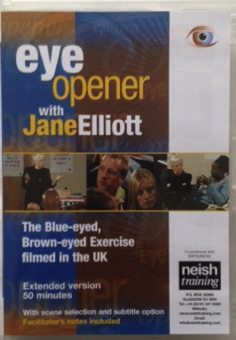 Jane Elliott, the internationally acclaimed diversity champion, conducts her ‘Blue-eyed, Brown-eyed’ exercise in Glasgow in 2003 with thirty-five volunteers from across the United Kingdom. Many of the blue-eyed participants were shocked at their own reactions to what for many of them was the new experience of being powerless. Many of the brown-eyed participants were shocked at how easy they found it to go along with what was happening even though they knew it was wrong. They all now have a better understanding of the systematic nature of racism as well as the awareness of how their actions – or inaction – can reinforce and perpetuate it. ‘Eye Opener’ shows this exercise is as relevant and necessary in the UK today as it was in Riceville, Iowa forty years ago. It’s a real ‘Eye Opener’! 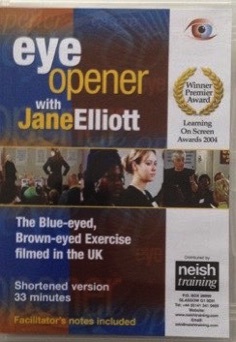 As well as containing the award winning footage from the short version, this extended version includes comments from the participants prior to the exercise and additional footage of their discussions with Jane Elliott during the post exercise debrief. With the help of two participants, Jane Elliott discusses height, skin colour, gender and age and exposes the rarely acknowledged advantages and disadvantages of being perceived as part of a particular ‘group’ – and perception is everything. Jane makes clear that we are not and never will be ‘all the same’ and instead encourages us to accept, value and cherish our differences whilst ensuring equitable treatment under the law. Jane Elliott shows that what we ‘know’ or perceive as ‘normal’ can be influenced to reflect a particular perspective, which may reinforce power inequalities in society. A standard copy of the Peters World Map is included. Additional copies of the standard map at £4 and the large map at £10 can be obtained from Neish Training. ‘superior’ and ‘inferior’, on the basis not of skin colour but of eye colour. The results were startling! This two day exercise taught them a valuable lesson that has stayed with them all their lives and had a positive impact not only on their self confidence and the way they relate to others but also on the way they have raised their children. More than thirty years later it is a lesson we still need to learn! 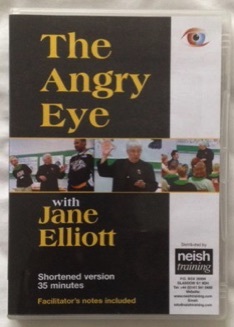 Jane Elliott conducting her Eye colour exercise with 24 American college students in March 2000. It was an experience that changed their lives. In the microcosm of society that she creates, Jane demonstrates that it is systematic discriminatory treatment because of power inequalities in society that leads to the negative behaviours that are often cited to characterise black people, women, gay men and lesbians, etc., not a genetic predisposition. Despite equality legislation, people are unfairly discriminated against for many reasons, such as racism and sexism as well as all the other ‘isms’. As a trainer, working regularly with white people from the majority community, I often hear participants say, there is no racism, that ‘they’ are just being oversensitive. In fact some people say that black people are getting unfair advantages, that legislation and policy have gone too far. But is there really no racism? 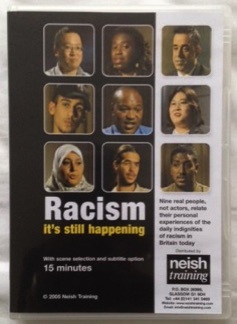 because of the colour of their skin and being visibly different, discuss their personal experiences. Unfortunately their experiences are neither uncommon nor unique.